With the Beauty Killer Gretchen Lowell locked away behind bars once again, Archie Sheridan—a Portland police detective and nearly one of her victims—can finally rest a little easier. Meanwhile, the rest of the city of Portland is in crisis. Heavy rains have flooded the Willamette River, and several people have drowned in the quickly rising waters. Or at least that’s what they thought until the medical examiner discovers that the latest victim didn’t drown: She was poisoned before she went into the water. Soon after, three of those drownings are also proven to be murders. Portland has a new serial killer on its hands, and Archie and his task force have a new case. Reporter Susan Ward is chasing this story of a new serial killer with gusto, but she’s also got another lead to follow for an entirely separate mystery: The flooding has unearthed a skeleton, a man who might have died more than sixty years ago, the last time Portland flooded this badly, when the water washed away an entire neighborhood and killed at least fifteen people. 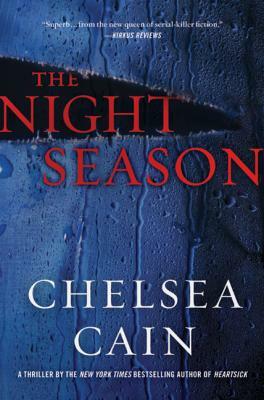 With Archie following the bizarre trail of evidence and evil deeds to catch a killer and possibly regain his life, and Susan Ward close behind, Chelsea Cain—one of today’s most talented suspense writers—launches the next installment of her bestselling series with an electric thriller. Chelsea Cain is the "New York Times" bestselling author of "Evil at Heart, Sweetheart," and "Heartsick." Both "Heartsick" and "Sweetheart" were listed in Stephen King's Top Ten Books of the Year in "Entertainment Weekly." Chelsea lived the first few years of her life on an Iowa commune, then grew up in Bellingham, WA, where the infamous Green River killer was "the boogieman" of her youth. The true story of the Green River killer's capture was the inspiration for the story of Gretchen and Archie. Cain lives in Portland with her husband and daughter.